Whether you are a backpacker that's into hiking in the wilderness, a tent camper that wants all of the comforts of home, or you are one that likes to hit the trail on wheels in your RV camper, this is the lens that can turn your camping food disasters into scrumptious delights with my easy camping recipes. 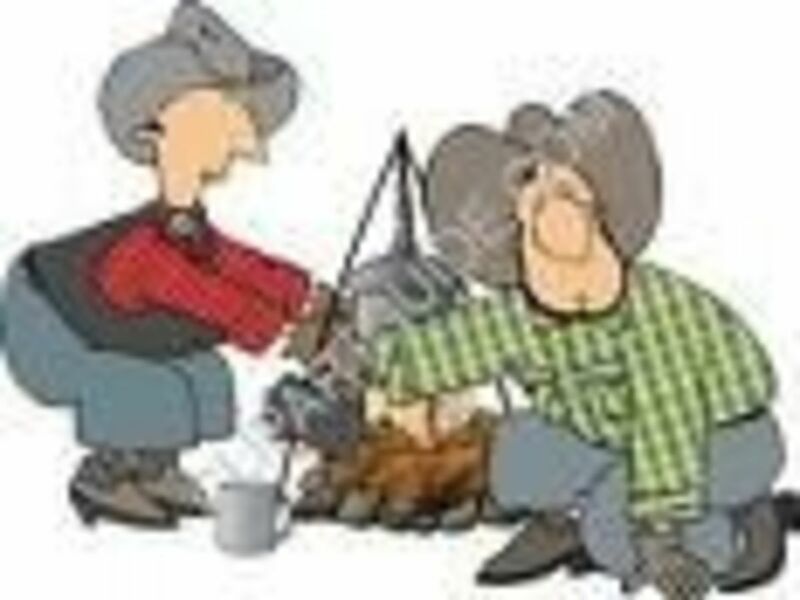 You will first receive an easy camping recipes basic food staples check list. Next comes easy basic camping recipes that can be adjusted to fit your individual taste and needs. 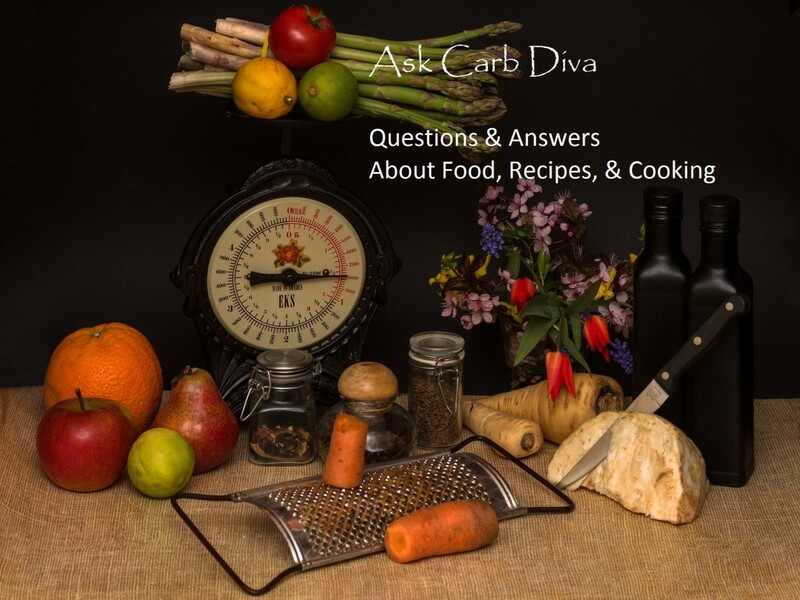 I will continue to add more involved recipes as time goes on, so keep coming back to see what has been added. First and foremost, what you need to bring from home to take to camp is a laid-back, casual attitude and a great sense of humor. Since there is no way that you can cook at camp the same way you do at home, why bother trying? The reason that you decided to go camping in the first place was for a little fun and relaxation and to have a more natural, and a little more primitive adventure. Along with this camping adventure comes the giving up of the amenities of the 21st century. 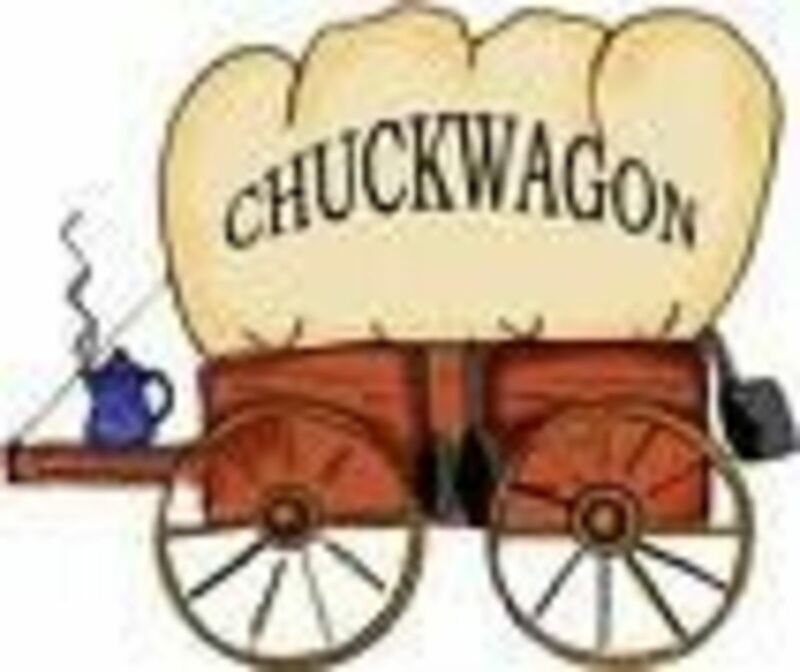 Forget about the gourmet cooking utensils and the microwave (unless you are in an RV). Keep in mind that if you could bring your modern kitchen with all of the modern conveniences with you to camp (and we have all seen people try) you would also be bringing all of the house work that goes with it, and that's NOT what you are coming to camp for! 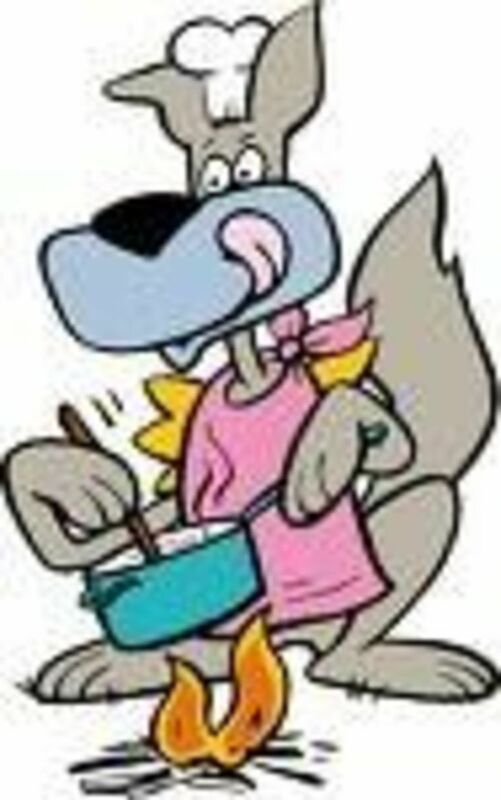 I have noticed that the biggest complainers at camp are the ones that lug the most pots and pans and dishes because they are never through putting it all away or cleaning it all up. 8. Rice (if you don't know how to cook rice on a campfire pack instant rice. To cut down on the basics that you bring make your supplies dual purposed. 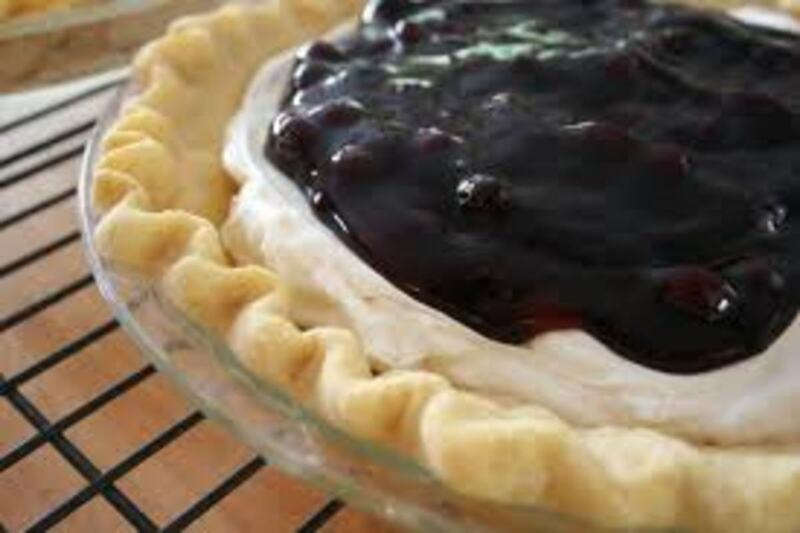 Baking mix can be used for biscuits, pancakes and to coat meat for browning. This eliminates the need for all 3 items; flour, baking mix, and pancake mix. If you don't plan on making biscuits or pancakes, and only need to brown meat or make gravy, instant flour canisters or gravy mix packets will suffice. One pot recipes are very nutritious, the easiest to fix, the most filling, and the clean up is a breeze because you only have one pot to wash! Works for me. The pot that I like to use is a cast iron Dutch oven because I usually cook for 4 or more people, however any 2 quart saucepan will do when you are just cooking for 2 or 3 people. Just keep in mind that the pot will get blacken from the fire, so if you don't want to have to scour the outside of your saucepan to remove the blackened soot, the cast iron works the best. 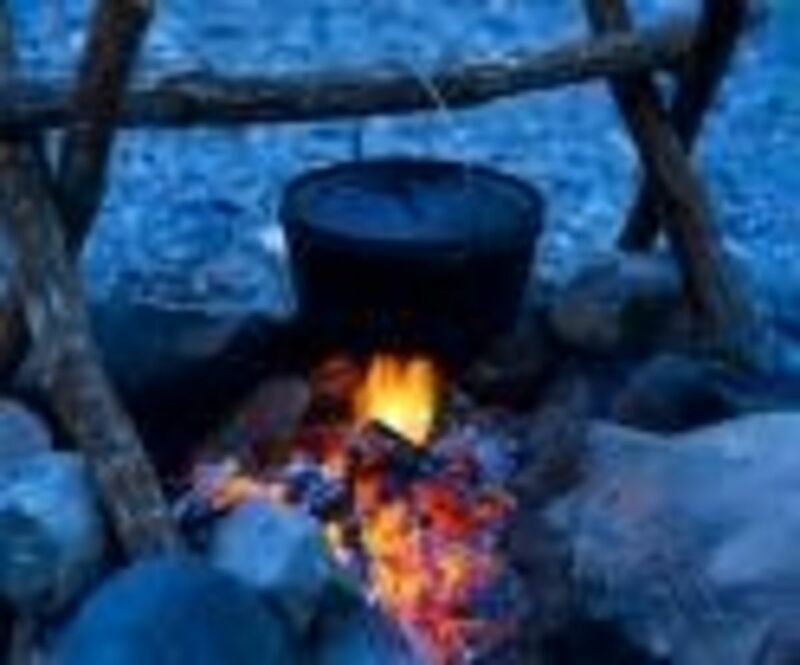 Cast iron also keeps an even heat with the cooking process and because the Dutch oven pots are so versatile, they are on my "must have" camping list. These are good quality examples of cast iron skillets. Logic is a good company that makes quality products. I like a 15" skillet because I usually cook for a lot of people when camping. This size can accommodate more pancakes or eggs and bacon at the same time. Pre-Seasoned is the way to go. This chicken fryer is a real good substitute for a Dutch ove. 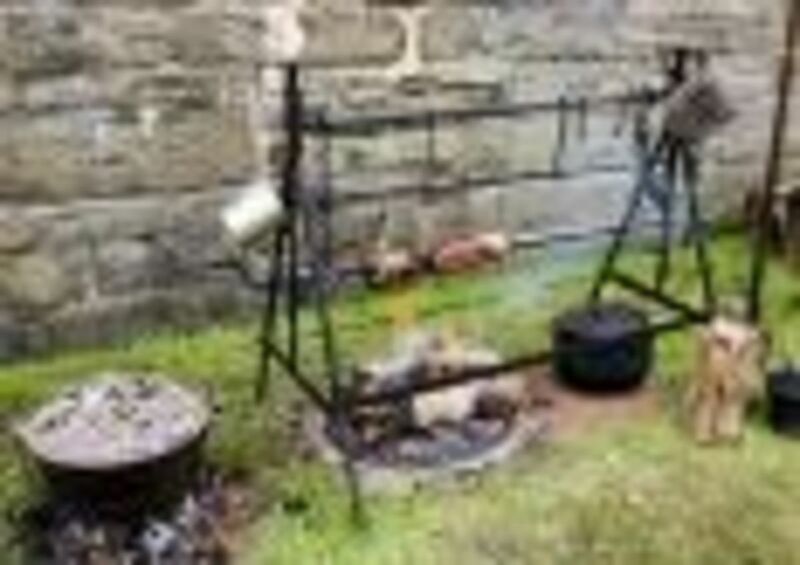 It is not as versatile, but it is deep enough to not only fry chicken, but it can be used camping to make stews, beans or even bake biscuits or corn bread. I usually prepare a thick, hearty beef stew at home and freeze it for the first night at camp. 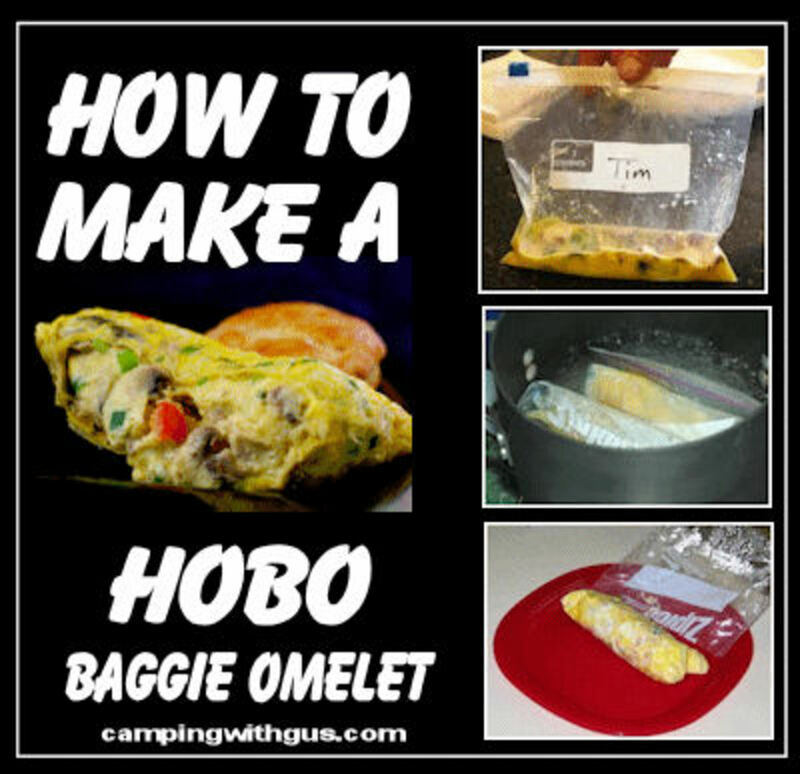 It can thaw out on the way to camp and just be reheated over the camp fire or on the camp stove. These first easy camping recipes are for preparing at camp. They are very basic, using canned meats. If these recipes need to be doubled to increased the quantity, just adjust the size of the pot that you will be using. These are basic recipes that can be adjusted to any ones preference. For instant, for the canned one-pot meals, instead of canned meat balls you can use fresh or frozen. You can substitute sausage for the meatballs if you want. 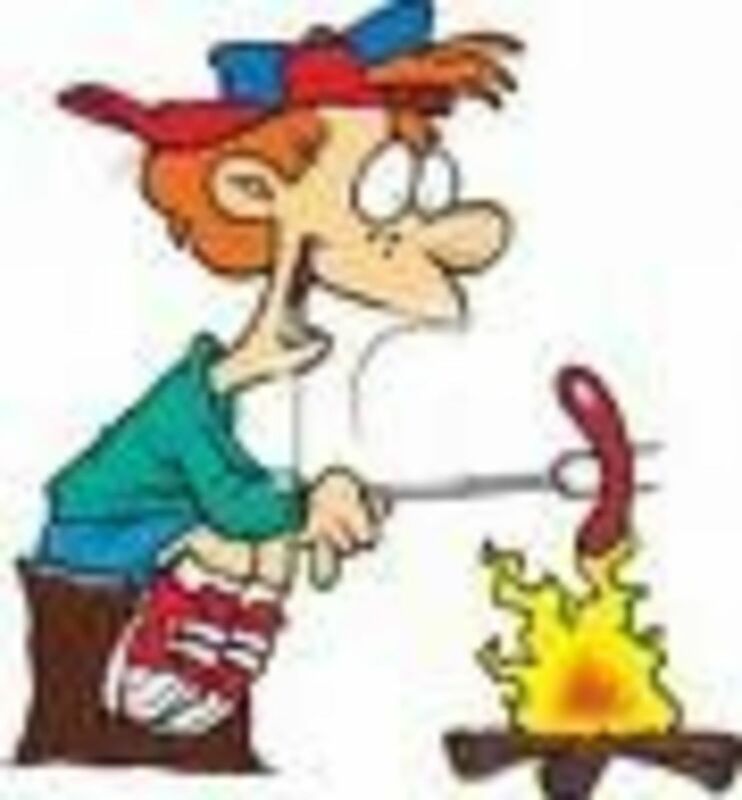 The options are endless and it is all according to what you and your camping party want to bring and want to eat. Whatever your taste might be can be adjusted to these recipes. Seasoning, herbs and spices can be added to suit your taste. You probably won't need to be adding any salt as most canned foods have enough salt already in them, unless of course you are buying low or no sodium products. Vegetables, either fresh, frozen or canned, can be added. Canned whole or diced tomatoes can be added to just about anything. The recipes can be spruced up anyway you want. Canned meats, obviously, do not need refrigeration so are good staples to have along on a long camping trip. 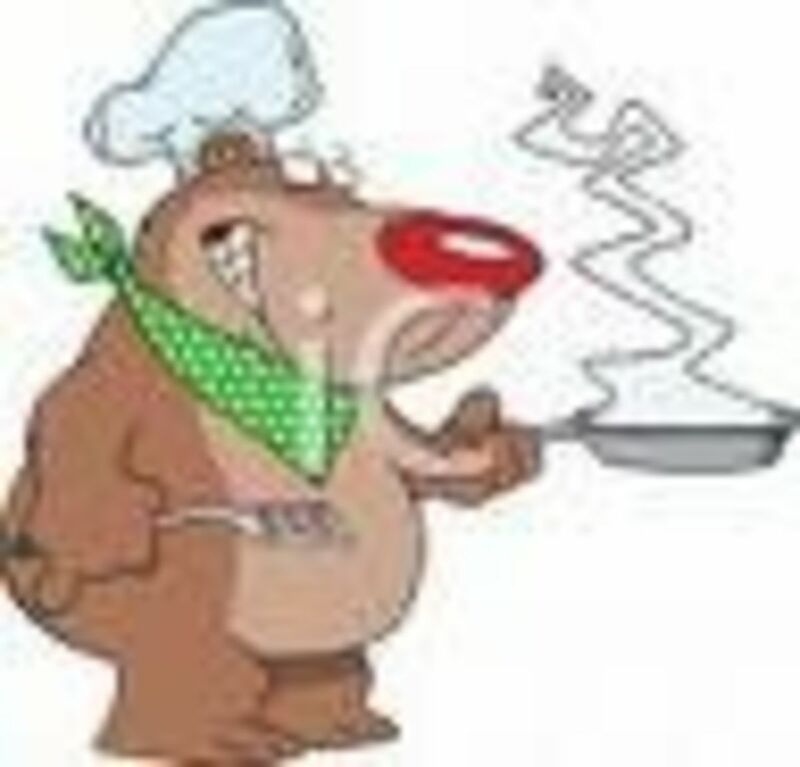 Like I said earlier don't worry about gourmet cooking went you're cooking, it all taste good around the camp fire! All recipes serve 3 unless specified. 1. Cook macaroni in a 2-qt. saucepan, drain and add milk, butter, and contents of cheese packet as directed on package. 2. Stir in remaining ingredients and heat through. If desired, sprinkle each serving with remaining onions. Combine ingredients and heat through. Combine and heat all ingredients. For a thicker sauce, stir in 1/4 c. dry bread crumbs or a few tablespoons of instant potatoes. 1. In a mixing bowl, break up and mash corned beef with a fork. 2. Mix in remaining ingredients. Let rest. 3. Meanwhile, heat 1-2 T. butter, bacon grease or cooking oil in a on medium heat in a skillet. 4. While the shortening is heating, shape the corned beef mixture into 3-inch patties or fat sausage shape logs. Option: If you have the panko crumbs, press the patties or rolls into the crumbs to coat before frying for a crispy coating. 1. In a saucepan, over medium heat, break up corned beef into chunks with a fork. 2. Add minestrone soup and water, according to soup can directions. 3. Add garlic, parsley and spaghetti sauce mix; bring to boil. 4. Turn down heat and simmer 10 to 15 minutes. 5. Serve in soup bowls sprinkled with Parmesan cheese and crusty French or Italian bread. Bread can be toasted on the grill. 1. Cook instant rice according to package direction. 2. Over medium heat, in a skillet, break up corned beef into bite-sized chunks. 3. 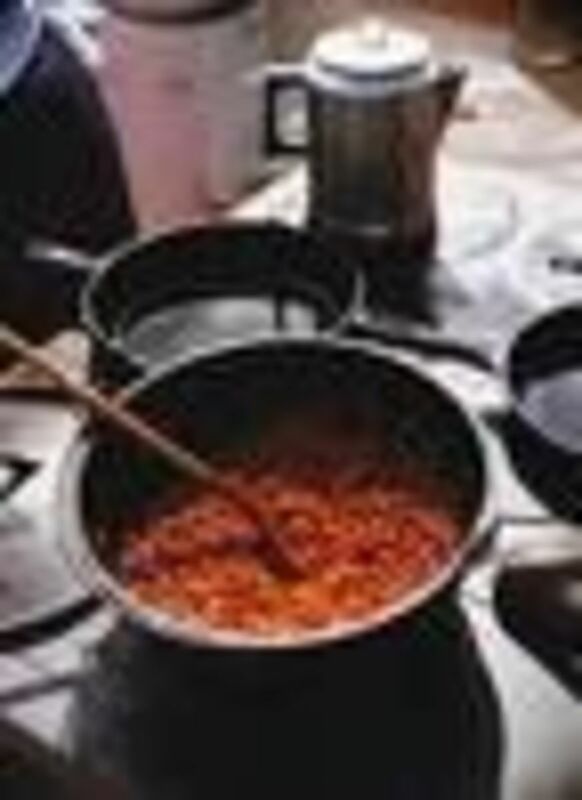 Add soy sauce; add 2 cans tomato sauce and 2 cans of water using the empty tomato sauce cans; add hot sauce to your taste. 4. Add fresh onion wedges to sauce just before serving so still a little crunchy. 5. Serve in a bowl over cooked rice. 1. Sauté rice in butter until it begins to brown. 2. Add water; bring to boil; lower heat and simmer for 5 minutes, or until rice is almost done. 3. Add rest of ingredients; heat through until rice is done. 1. Cook macaroni according to package direction. 2. Add rest of ingredients except for Parmesan cheese. Stir and heat through. 3. Sprinkle with Parmesan cheese and serve. 1. Prepare rice according to package direction, but add remaining ingredients to simmer with the rice mixture. As with the canned Easy One Pot Recipes, these recipes using fresh meat can be altered, or increased any way you want. They are easy to fix and all you need to do is add the seasoning that you like. You can even switch the meat if you want. Don't like hot dogs? Instead use sausage, ground beef, chopped chicken or pork. Brown ground beef in pot with garlic salt and pepper. Drain fat, if needed. Add onion, cook and stir for 2 minutes. Add rest of ingredients except water and heat through. Add water as needed if too thick. Brown ground beef in skillet; drain fat if needed. Stir in beans and macaroni; heat through. cast iron skillet or Dutch oven. (Use cold water rather than the required boiling water.) Break ground beef up into bite size chunks and add to mixture. Sprinkle with onion soup mix and stir. Cover tightly and cook over low heat 45 minutes. Brown ground beef in skillet with garlic salt and pepper; drain fat if needed. Stir in seasoning mix, and water; simmer 10 minutes. Stir in the macaroni and cheese and heat through. 3. Add remaining veggies, seasonings. Cover, cook over low heat, 15 minutes until vegies are tender. Combine wine or water and flour in covered jar. Shake and stir into skillet. Cook and stir until sauce is thick, 4 minutes. Slice hot dogs into bite-sized pieces; brown in small amount of bacon grease or butter. Stir in all beans, heat through. Serve over rice, biscuits, cornbread, corn chips, tortilla chips or with warmed tortillas. Sprinkle with cheese. 1. SautÃ© onions, bell peppers and hot dogs in skillet. 2. Add Spanish rice mix. 3. Use the liquid from the canned tomatoes instead of water. Add tomato sauce and seasonings to mixture. Cook till liquid is absorbed and rice is done. 4. Just before serving, add peas, stir and heat through. Option: Vienna sausage or SPAM can be substituted. The benefit of using Vienna sausage or SPAM is that they do not require refrigeration. 1. Sprinkle chicken with seasonings and brown in bacon grease or oil. 2. Add remaining ingredients except soup. Cover and simmer 45 minutes. 3. Add soup vegetables and heat through. If too thick add, 1/2 can (cream of mushroom soup can) of milk, water, or white wine. 1. Season chicken and brown in oil. Cover and simmer 30 minutes. 2. Stir in remaining ingredients, bring to boil and simmer, covered for 15 minutes more or until rice is tender. 1. Sprinkle chicken with seasoning. In a large cast iron skillet, brown chicken in hot oil. Drain fat. 2. Cover and simmer over low heat for 45 minutes, or until tender. 3. Mix gravy mix and spices in a 1-cup measure. Add water and mix to dissolve. Push chicken to the side in skillet. 4. Pour gravy mixture into the skillet with the pineapple-orange sauce from yams. Stir while cooking, until thickened. 1. Brown sausage in a little bacon grease. Add the rest of ingredients. Stir and heat, until well combined. 2. Simmer 15 minutes. If too thick add more milk, 1/2 of can at a time, until right consistency. 3. Simmer 15 more minutes. Serve in bowls with crusty bread. 1. Cut sausage links in bite-size pieces; fry until browned. 2. Add fresh vegetables and sautÃ© 5 minutes longer. 3.Stir in rice mix with required water, omitting the butter. 4. Bring to boil; cover; simmer 25 minutes. 5. Stir in peas and seasoned salt; heat through. Very nice, complete camping dining set. Good quality. Makes it better for the environment to rewash your dishes rather than burning paper plates. Enamelware is sturdy and will last through many camping seasons. The flatware comes in a nice nylon wraparound holder with compartments for each piece. Beans are so good for you which is an added plus when camping. They are packed full of protein, minerals, vitamins and fiber. These next easy one pot meatless camping recipes are sure to fill and please while out in the wilderness. 1. Add everything to pot, including can liquid, except beans and macaroni. Cover and cook over medium heat 20 minutes. 2. Add beans, hot sauce and cooked macaroni to vegetable mixture. 3. Bring to a boil; cover and simmer until soup is thoroughly heated. Stir occasionally. Serve in bowls topped with grated Parmesan cheese. 1. Strain liquid from all cans into pot, add broth and soy sauce; bring to boil. 2. Add tomato, onion, garlic, and herbs; cover and cook 8 minutes. Add squash and cook 8 more minutes, or until tender. These are "all-day" stews. They are a meal-in-one that can simmer in the cast iron pot on the coals. They can pretty much be forgotten until everyone is hungry. They are ready to eat in several hours, but it doesn't hurt them to stay in the coals longer. A good batch of coals should be fired and banked with ashes to last throughout the extended cooking time. To increase the heat just add more coals; to decrease the heat just remove some. 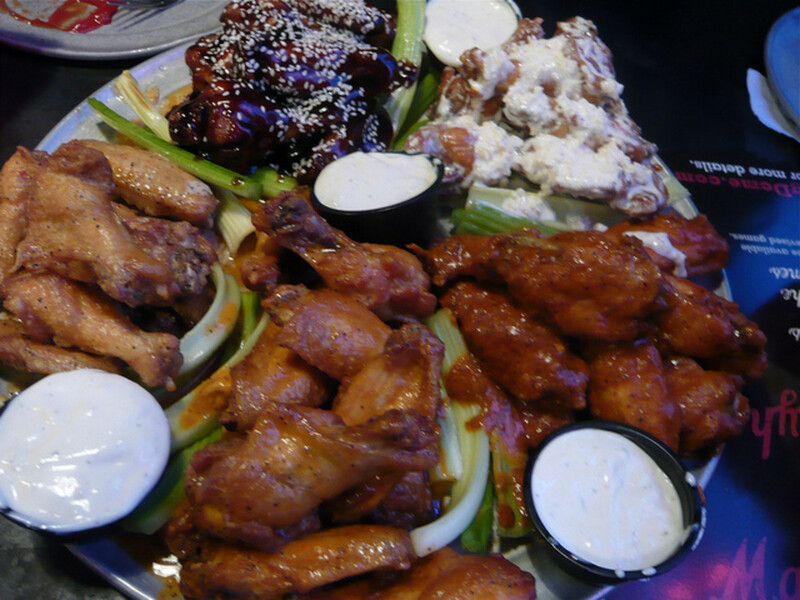 Only plan these types of meals for a day that someone will be at the camp to watch it. Never leave a fire unattended. The food itself won't need much watching. Perhaps a stir and a little water added after the first hour, but that's about it. This is a good way to cook a pot of chili or a pot of beans, too. If you buy preseasoned pans (and you should), you can use the pans with little fuss. the pan is still warm. has a thin coating of the oil. If you have stuck-on food or you inherited a pan that is rusty or gummy, scrub it with kosher salt. a thick wad of paper towels to scrub the pan. If cooking acidic foods or improper cleaning has removed the seasoning form your pan, it will look dull, patchy and dry and food will stick to it if you try to cook with it in this poor condition. of water dissipates on contact. set of tongs to hold the wad of towels. That's all there is to it. 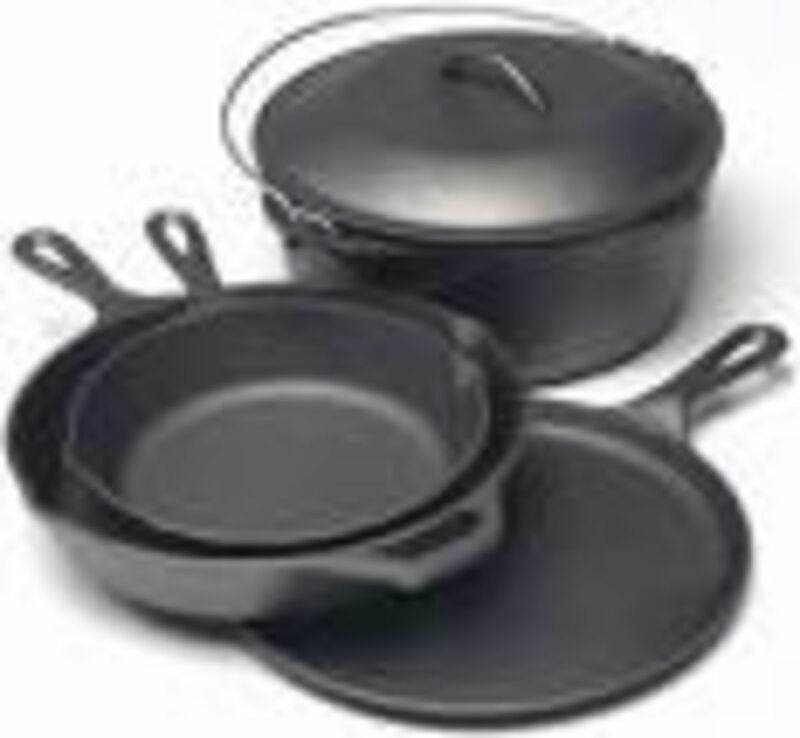 If you take care of your cast iron skillets and cookware they will last several lifetimes. I still have one of my grandmother's old cast iron skillets. 1. Roll beef in flour and brown in hot oil in Dutch oven. 2. Add remaining ingredients except potatoes and vegetables. 3. Simmer over coals for 3 hours or until beef is tender. Add more water if necessary. 4. Stir in vegetables; season to taste, and heat through. 1. Line bottom of Dutch oven with pebbles. Place a piece of heavy duty foil over pebbles, and arrange alternating layers of ham, pineapple slices, and yams; spreading jam over the yams. 2. 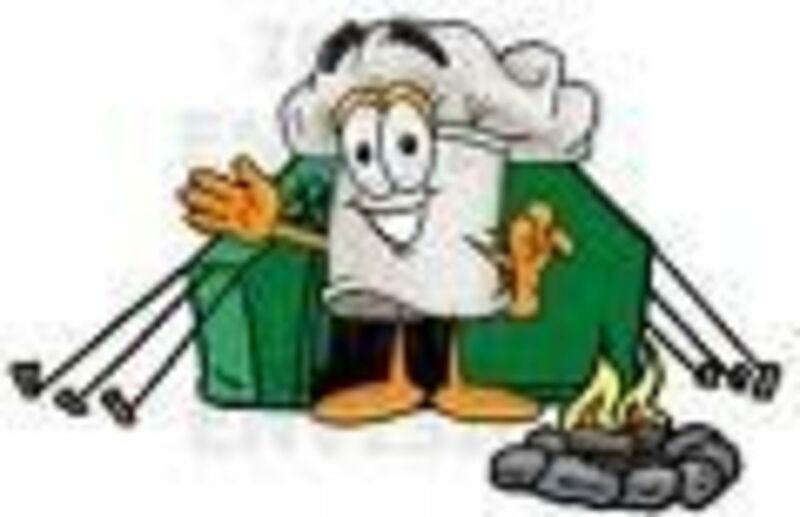 Cover tightly and place Dutch oven on a bed of coals. 1. Line bottom of Dutch oven with the 4 slices of bacon. 3. 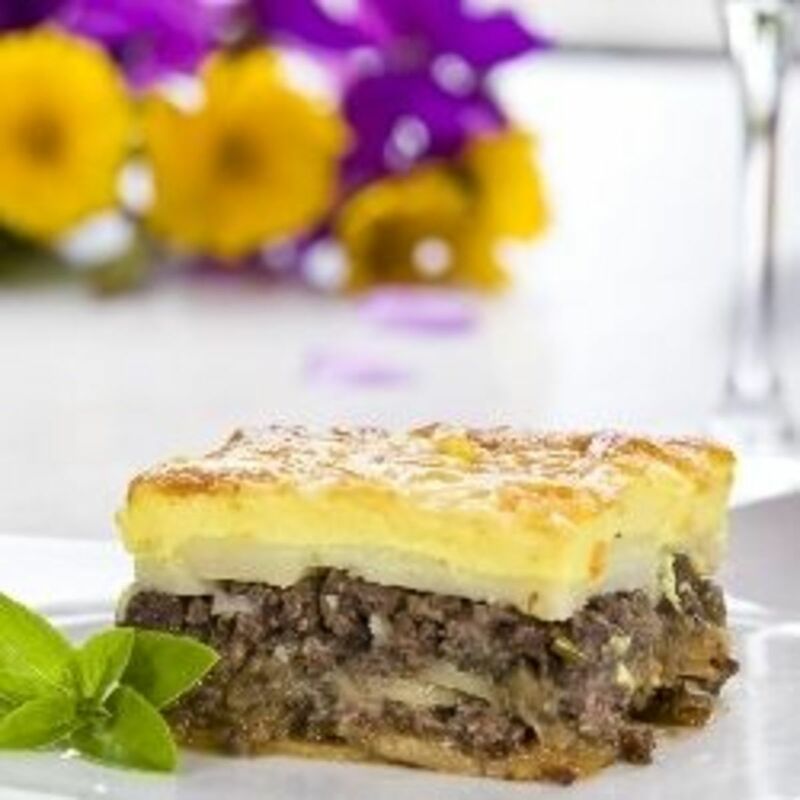 Arrange layers of steak, onions and potato slices, in that order, over bacon, repeating layers until all of the ingredients are used up. Season each layer as it is placed. 4. Cover and place over coals. Cook 2 hours or more, until meat is tender. Foil is faster, foil is fun, foil is the dishwasher's friend. 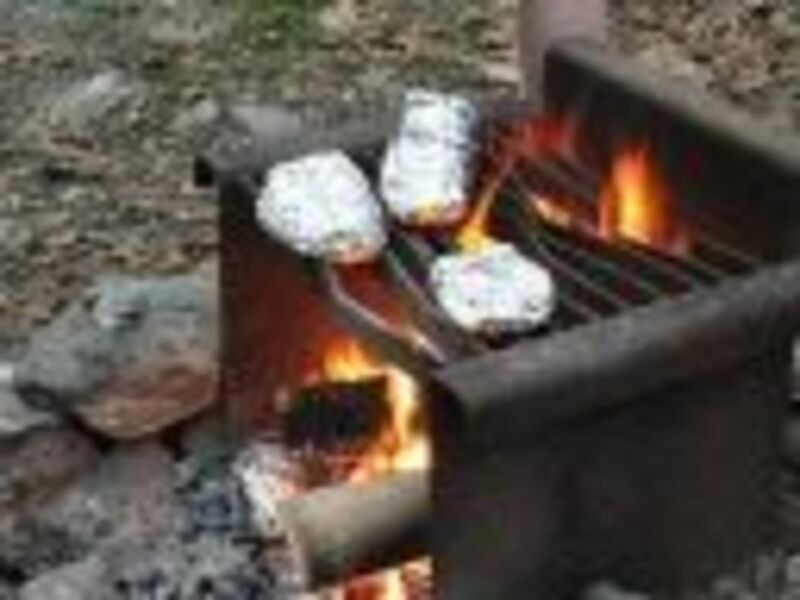 Foil can be used for a multitute if things when out camping, such as making crude pots to cook over the fire, disposable grates for the campfire fireplace, wrapping food to cook in the fire, make-shift plates, bowls and cups, warming bread, lining the Dutch oven or frying pan or a million other things. Don't forget to pack the foil! 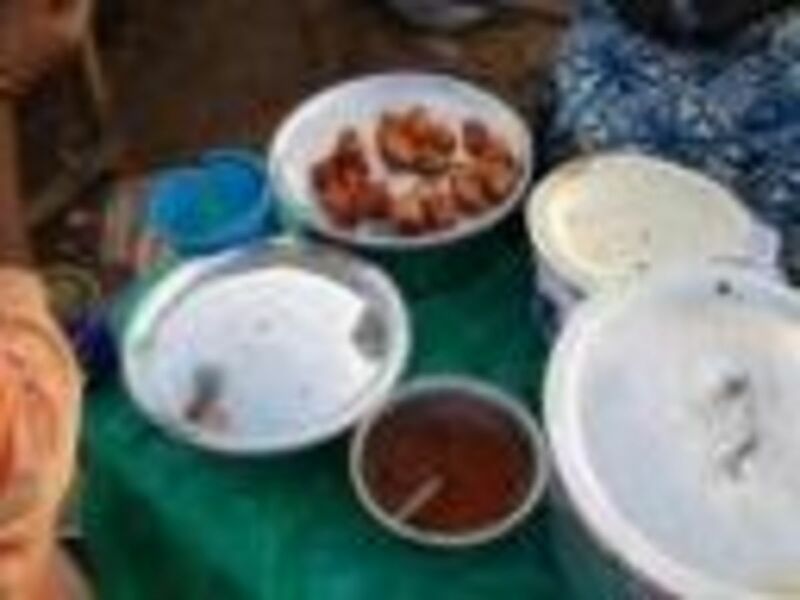 The following are simple recipes that can be made at home, wrapped in foil packets and frozen until needed, or they can be made right at the camp site. Make the packets using heavy duty foil. When foling the dinner packets, allow room for the steam to expand, and use a double fold down the center and a double fold on each end. An easy, nutitious breakfast from around the campfire to start your day. 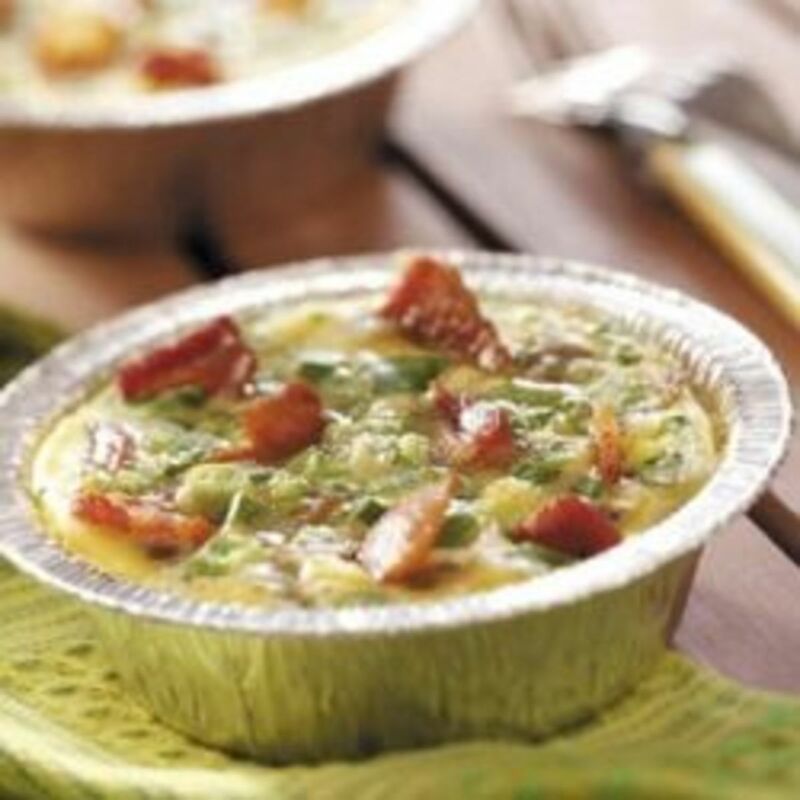 We have been making these for years, but I recently found a similar recipe using bacon instead of sausage at Taste of Home Recipes This is where I borrowed the photo from. 1. Prepare the grill for indirect medium heat. 2. Coat each foil tart pan with nonstick spray. 3. In a small bowl whisk the first 6 ingredients. Pour into foil tart pans. Sorinkle with cheese, green pepper, sausage and green onions. 3. Cover each foil tart pan with foil. Grill covered, for 20 to 25 minutes, or until eggs are completely set. 5. Be Careful when opening foil to let steam escape. * You can substitute any kind of sausage that you like. I often use Portuguese or Polish sausage. Note: you can't find foil tart pans, make your own with heavy duty foil. Simply invert a 10-ounce bowl on to a work surface and cover with 3, 9-inch square, layers of foil over the bowl to form its shape. Remove bowl and crimp edges of foil bowl to finish forming the bowl. 1. Shape ground beef into 6 hamburger patties. 4. Cook on grill for about 30 minutes. 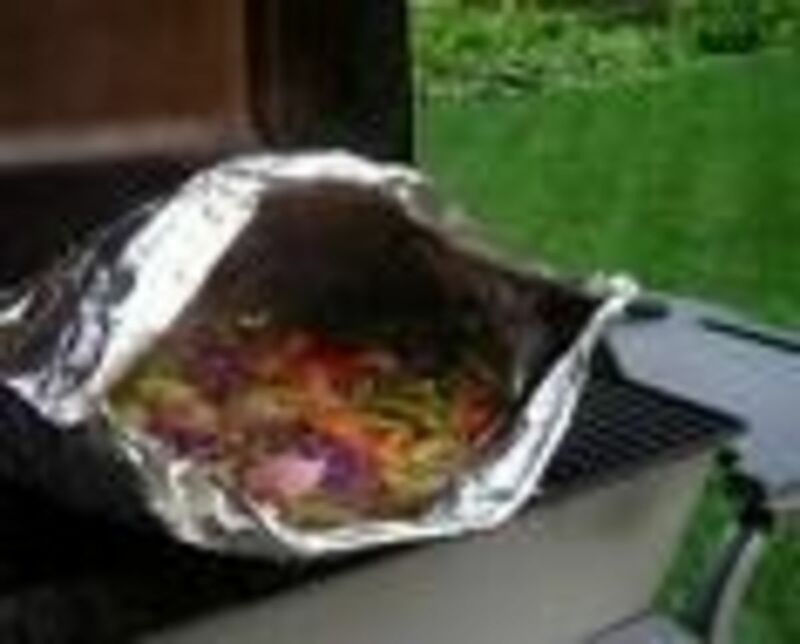 Tear off a large piece of heavy-duty aluminum foil; spray with nonstick cooking spray. Place raw hamburg in center of foil and layer the rest of ingredients on top. Put pat of butter on top. Fold as instructed below. Repeat for each dinner. Cook for about 1 hr. or until hamburger is done and vegetables are tender, turning occasionally to prevent burning (not necessary to turn if baked in an oven at 350 degrees). FOLDING A FOIL DINNER: Fold long edges of foil together and fold down to food. Roll other 2 ends up to food. Gently press top seam down to seal. ALWAYS OPEN COOKED FOIL PACKETS CAREFULLY TO PREVENT STEAM BURNS. Variations: Use your imagination--add 1/3 - 1/2 can undiluted soup (such as cheddar cheese, golden mushroom, or cream soups), add frozen veggies instead of fresh, or add fresh mushrooms or zucchini. Pat's book contains a section on "Foil Cooking" with recipes such as "Beef Stew in Foil," "Kraut & Ribs Foil Dinner," and "Ham & Sweet Potato Foil Dinner." 1. In a bowl, mix together cream of mushroom soup and onion soup mix. 2. Butter or spray with cooking oil, each piece of foil. 3. On center of each piece of foil, put one sliced carrot; 1 cubed potato; 1/4 of chopped meat. 4. Season each with garlic powder and pepper. Spoon equal amounts of soup mixture on top of meat and top with peas. 5. Wrap securely in foil and place in hot coals or in a dutch oven, buried in coals for 50 minutes to 1 hour. 6. Garnish each with 4 cherry tomato halves . 1. 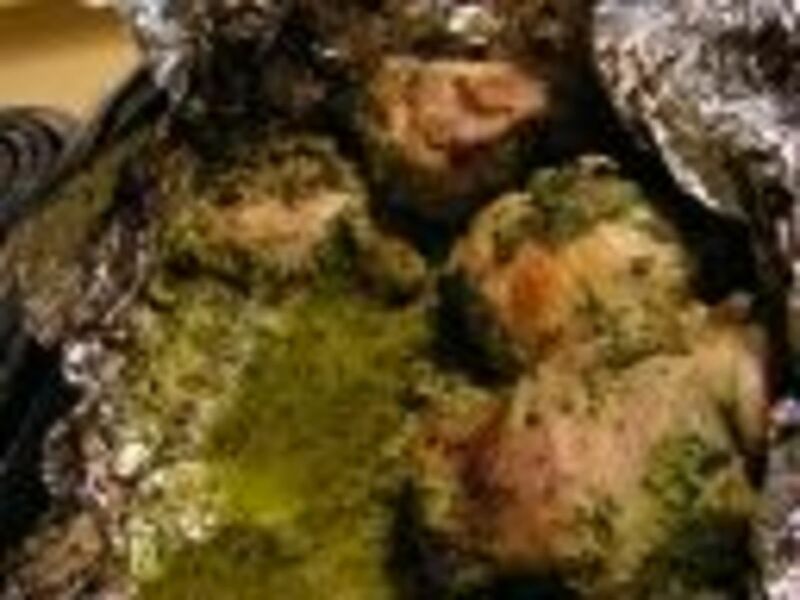 Smear each piece of foil with 1 t. butter to prevent chicken from sticking. 2. Place a chicken breast on a piece of foil. skin side up; sprinkle with garlic salt & pepper. 3. Combine soup, parsley and rice; divide evenly into 4 portions and spoon on top of each chicken breast. 4. Sprinkle with cheese and paprika. Fold foil over chicken and seal edges. 5. Cook on grill 5" above the coals for about 45 minutes. Do not turn. Option 2: Omit rice and use the sauce that accumulates in packet on mashed potatoes. On each piece of foil, place 1-pc. salmon. 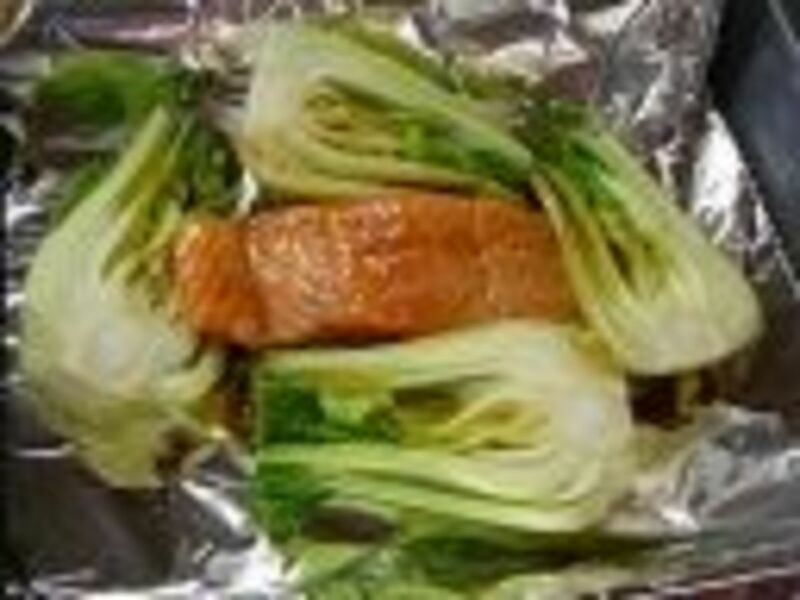 Place 4 baby bok choy around salmon. Splash 2 T. teriyaki sauce oversalmon and bok choy. Sprinkle 1/4 t. minced ginger and 1 minced garlic clove over fish. Splash with sherry, wine or whiskey. Salt and pepper to taste. Seal foil packets and through on grill for about 20 minutes, depending on how hot the coals. If fish flakes easily it is done. Sprinkle with sliced green onion before serving. Good served with rice or grilled baby red potatoes. 1. Spray each piece of foil with olive oil to prevent fish from sticking. 2. Place 1 piece of fish in center of each piece of foil. Serve with salad and grilled corn on the cob. 1. In the center of each piece of foil, spoon a portion of each ingredient. 2. Bring corners of foil together, folding seams and twisting top to seal and form a bag. 3. Place on grill and heat through about 15 minutes. 1. In a large bowl, combine first 9 ingredients. Gently stir in tomatoes. 2. Place 8 double thicknesses (2 pieces each) of heavy-duty foil on work surface. Divide mixture among each piece; making sure each packet has 2 tomato wedges. Top each with a cube of butter. 3. Fold double thickness of foil around mixture and seal tightly. Grill covered, over medium heat for 20 to 25 minutes, or until vegetables are tender. 5. Carefully open foil to let steam escape; drizzle with dressing. Fresh veggies cook quickly and deliciously in foil. With a good steam seal, a miniature pressure cooker is created and the vegetables are table ready in no time. 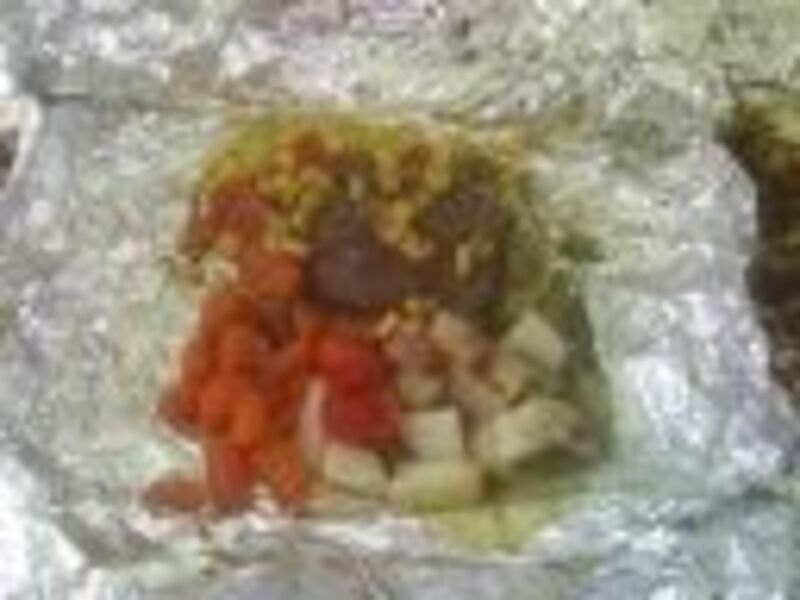 The veggies can be cooked in one family style packet or in individual servings and eaten right out of the foil. Just add a spoonful of water, a pat of butter per serving, and your choice of seasoning to taste. Whole potatoes should be pierced before wrapping, and once wrapped can be buried in the coals for faster cooking. Place cleaned dried mushrooms on foil. Dot with butter, sprinkle with garlic salt, and slash with wine or beer. Wrap with double folds and cook on grill about 25 minutes. Great with grilled steak or fish. Place all veggies in center of foil, dot with oil or butter; sprinkle with cheese, garlic salt and pepper. Wrap with a steam seal. Place over coals or on the grill for 15 to 20 minutes. *I use olive oil for zucchini and butter for yellow squash and a little of each if using both squash together. SUCH a good lens. Spam in the guestbook though. That's a sizable collection of recipes there June, thanks for sharing! Great lens. I can't wait to go camping and try these out. Great lens. Useful tips for campers and thanks for the recipes, too. This lens makes me want to go camping all of a sudden. Great recipes, can't wait to try them. 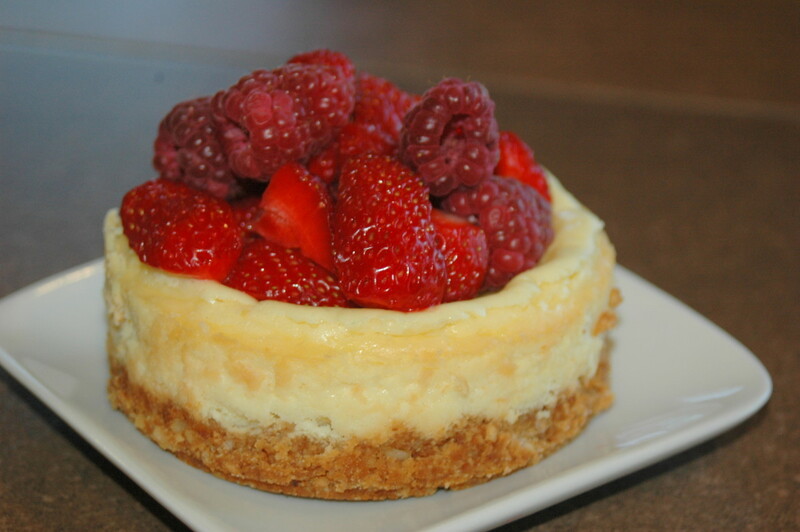 My mouth is watering at the sight of all your delicious recipes! I'm not going to wait to go camping to make them, I'm starting on one right now! Great job!! This information is invaluable - thanks! Good ideas for camp cooking. I cook on a fire at home every night so I will be trying some of these. Holy cow at the reciepes!! I love cooking with my cast iron skillet on an open fire. Then the next morning using is with egg. FLAVOR! Thanks for the easy tips and great recipes! These recipes will make for some happy campers! Very thorough list! Squid angel blessed and added to my camping neighborhood lens. Angel blessed for some new recipes I hadn't even thought of to use when camping. Hooray! You have some really tasty sounding recipes here to break up the burger, steak and hotdog camping food monotony. Thanks for sharing. What a nice collection of recipes you have here! I will have to give a few of these a try this summer. Fantastic tips and recipes. 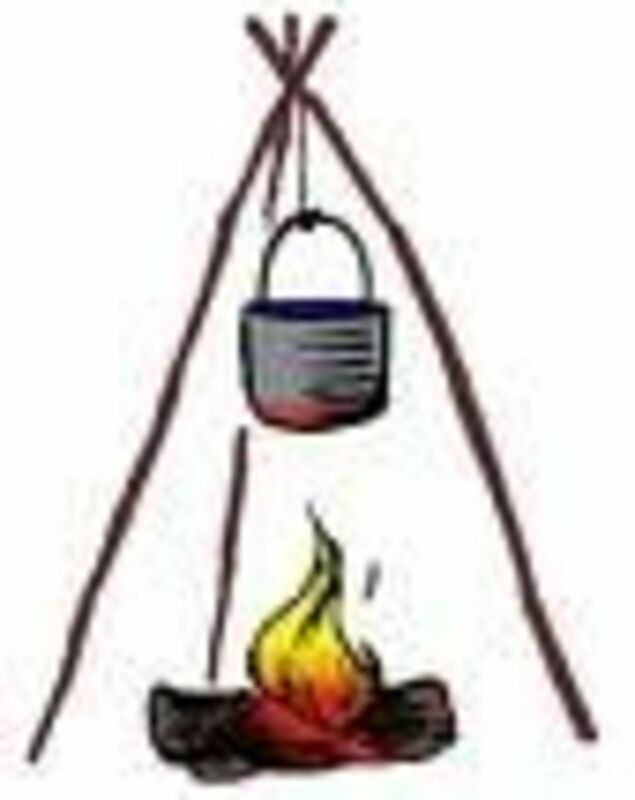 I have never done any campfire cooking and don't know how I would fare. I would definitely like to try some of the recipes though. Your dutch oven round steak recipe sounds mouth watering. I'm going to give it a try. Thanks. Great lens. I can see you have just gotten started on it. I will be back to see what you add. I like the idea of the basic recipes. I can already see the multitude of ways they can be adjusted to vary "what's for dinner". % stars and lensrolled to my Hawaii lens. Thanks for stopping by my lens.